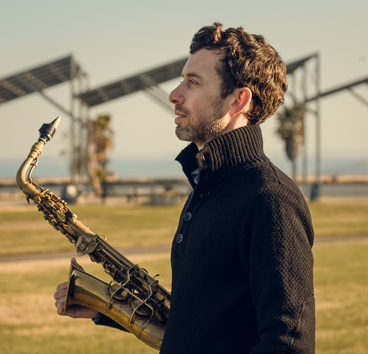 Aram Shelton is a multi-instrumentalist on saxophones and clarinets, a composer & improviser, and creates electroacoustic music with computer-based electronics. While the music he makes is spread across a variety of aesthetic lines, it is connected by the importance of improvisation to develop material and express the individuality of musicians. He currently lives in Oakland, California. Beginning on tenor saxophone while growing up on a small ranch in southeast Florida, Shelton switched to alto saxophone in college, as a way to focus on the classical techniques of the instrument. After college, Shelton lived in Washington DC for a summer where he met other young musicians interested in making music unrestricted by style. He moved to Chicago in the spring of 1999, inspired by the amount of musical activity and quickly became involved in the city's creative music scene. While there, Shelton developed his playing style on alto saxophone while also studying clarinet and trumpet. He played creative jazz and improvised music in many settings, including the groups Dragons 1976, Arrive, and Rapid Croche. Over time he also became interested in the use of computer-based electronics for the live sampling and manipulation of acoustic instruments, and formed the group Grey Ghost with Johnathan Crawford. After several productive years in Chicago, Shelton moved out west to California to focus on his electroacoustic music at Mills College. Shelton continues to focus on live improvisational-based music that uses both acoustic and electronic instruments. In California the groups Flockterkit, Ton Trio, Son of Gunnar Ton of Shel, the Shelton/Healy duo, the Pink Canoes, and Settled represent his music. He maintains his connections to Chicago through the groups Dragons 1976 (Multikulti), Arrive, Rolldown (482 Music), and Keefe Jackson's Fast Citizens (Delmark). Along the way Shelton has had the chance to perform throughout the United States, Canada and Europe with many talented musicians, including Tim Daisy, Ken Vandermark, Jason Ajemian, Josh Berman, Audrey Chen, Fred Lonberg-holm, Dave Rempis, Damon Smith, Steve Bernstein, Weasel Walter, Jason Roebke, Liz Albee, Rob Mazurek, Matt Bauder, Jessica Pavone, Fred Frith, Josh Abrams, Harris Eisenstadt, Jeb Bishop, Tim Perkis, Kevin Drumm, Jon Raskin, Frank Rosaly, Guillermo Gregorio, and Chris Brown. His playing and music has been documented on several albums through various imprints including 482 Music, Locust Music, MultiKulti, Edgetone, Delmark, and his own Singlespeed Music.